We have three nest boxes. The first two and the colour cameras installed inside them were purchased from BoxWatch in 2001 and 2002 respectively. Both cameras have now been replaced - after nearly 15 years this is hardly surprising. 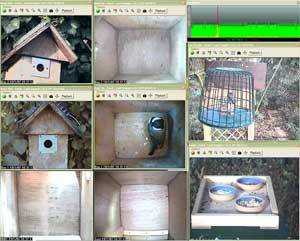 The third nest box was installed in January 2007 and replaced a sparrow terrace that we had installed on the side of the house several years earlier. We replaced it because the only bird that had shown any interest in the terrace was a bluetit which took over the middle section in spring 2006 and successfully raised a brood of chicks! The third box was designed and built by me in order to house two cameras, one in the conventional place over the nest and the other to the side of it. This high quality camera is also IR sensitive and so we have installed IR lighting as well as the normal lighting. The video signals from the three boxes and the signals from several other cameras installed in the garden are connected to my PC using three Axis P7214 video servers. These have enabled me to remove all the Euresys video capture that used to perform this function. The signals from all the analogue cameras are digitised by one of the Axis P7214 Video Encoders and the output from these, and a couple of other digital network ready cameras, come to my PC as digital streams via a new PoE capable switch, the Netgear Prosafe GS108PE. The PC is currently a quad core processor machine based on a Gigabyte H97-D3H motherboard, Intel Core i5-4690 processor, 8GB of main memory, 256GB Samsung 850 Pro SSD, a 256GB disk for non i-Catcher data, a 6TB disk for the i-Catcher files, and an NVIDIA GeForce GTX 750 Ti display adapter. The OS used is Windows 10, and has been since June 2016. To take advantage of all this hi-tech gear, and with help from Huw Edwards of i-Catcher, I have installed the latest i-Catcher software to support them. This means that we can now take videos at 25 frames/sec and hope to post on this website some of the more interesting episodes that occur during the season. This picture shows the second screen with its eight feed windows. If you click on the image you will get a bigger version! Although this picture is now very out of date, it shows the general idea of what it looks like. Each of the nest boxes has an external camera pointed at the nest box hole so that we can see the comings and goings of the parent birds - and very briefly, the chicks when they fledge! Other cameras point to our bird table, a hedgehog feeding station, a fat block feeder at the bottom of the garden and one of our bird feeder poles. The software used to capture the images from these cameras is i-Catcher Console from i-Catcher. This has been upgraded to version 6 which enables me to record full 25fps video from the network cameras. These include the old analogue cameras which are attached via the video servers. As well as this software, I bought the Axis video servers, the Netgear switch and most of the video cameras from i-Catcher who were most helpful in supporting me during this major upgrade. In 2004, the lighting in each of the Boxwatch boxes was enhanced by adding three white LEDs and a resistor in parallel with the existing light. The LEDs are Nichia NSPW510BS obtainable from Maplin as product NR73Q. The LEDs have a max reverse voltage of 4v and were installed in series with the resistor which is a 1k variable resistor set to about 600 ohms. The additional slightly bluish light has noticeably improved the colour of the bluetit's plumage. Although the original pea bulb installed as part of the original kit from Boxwatch has to be replaced nearly every year, these are the original LEDs - still going strong after more than 14 years! Since November 2012 we have had one telephone line with a high speed fibre optic broadband link. Our ISP is Zen Internet and we are currently using their standard Unlimited Fibre 2 service. This carries all the webcam traffic as well as our normal internet traffic. We are about 400m from the local green cabinet, but in spite of this we get a download speed of about 60Mb/s and an upload speed of about 15Mb/s compared to the theoretical maximum of 76/20Mb/s. This link uses a D-Link DIR-880L router. I eventually got fed up with the unfriendly user interface of the ISP supplied router. This high speed line handles all our webcam traffic with ease. Additional digital photographs are sometimes taken using an iPhone, an iPad or a Canon EOS 20D digital camera. The biggonline website is hosted by 1&1. Many people have asked us how to go about setting up a webcam. Although we are not experts, we have written some notes here which we hope will answer some of these questions. If you want to know more, please contact us by using the Feedback form.